IMPORTANT - General Painting Instructions: All shading is floated. When painting each area of the design, allow a small border of the blue background to show through (in other words, don’t let colors of sections meet each other - allow a think line of blue to separate them). Faces: Paint face and necks Flesh Tan. Shade outer edges and under chin with Burnt Umber. Transfer details. to outline eyebrows, nose, and lips. Use thinned Black to line eyes. inside of sleeves by hands Dark Forest Green. Float 1:1 Flesh Tan/Wedgwood Green on top of sleeves. Hair: Transfer the outline of the hair (Mary and Joseph) where it covers clothing. Paint Dark Night Blue. 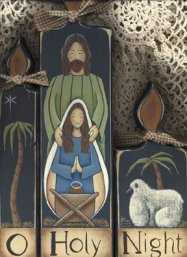 Use your 18/0 to paint wavy Dark Brown hair on Joseph and Mary, allowing some dark blue background to show through. Next paint wavy Autumn Brown strands. On Mary only, paint wavy Raw Sienna strands of hair. On Joseph, lightly line Butter Cream around top of head area. Mary’s Veil: Paint outside of veil (top and sides) Butter Cream, inside of veil Flesh Tan. Shade inside Burnt Umber. Sheep: Paint face and front legs Black. Use #4 Scumbler (and a minimum of paint) to pounce Flesh Tan wool, allowing dark blue to show through, especially to shade around legs. Go back and pounce Butter Cream on head, along top of back, tail, front of chest, and front of rear leg to lighten those areas. Thin Butter Cream and lightly paint highlight on ear, face, and front legs. away some of the top coats of paint from the center of the candle to allow bottom colors to show through. Attention wood cutters - these are the wood dimensions, you may need to resize the line drawing. 'O' candle is 1-13/16" wide, 'Holy' candle is 3-3/8" wide, and 'Night' candle is 3-3/8" wide.